This past year as Hurricanes Florence and Michael roared through the south, hundreds of marinas put their hurricane plans in place and hoped for the best. While predictions for Hurricane Florence were for a Category 5, completely devasting storm, she fortunately dropped to a Category 1, but stayed around long enough to cause severe flooding. Hurricane Michael, on the other hand, came ashore with the full force of a Category 4 storm and left in its path complete destruction. 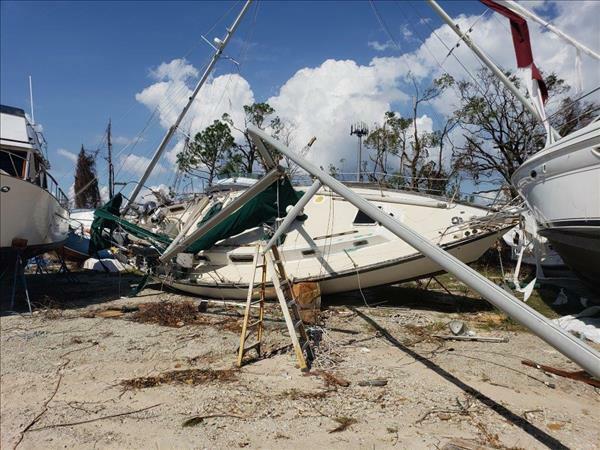 As with all storms, the insurance industry was put into action as soon as the winds and waters subsided, working to ensure marinas could repair and rebuild as quickly as possible. Two agents, veterans of the marina and boatyard industry, shared what they saw and what they recommend. Insurance companies call DJ Tyler, vice president of Marine Specialties, to go out on site to look first hand at the damages and develop a scope of repairs, ensuring bids received for the work are consistent with the damage that was recorded. Dan Rutherford, director of claims and risk management for Maritime Program Group, visits the marinas and yards that are insured through his company to assess damages and process claims. To start with the good news, both insurance veterans say that storm damage does provide an opportunity for marinas to come out of the storm with a facility that is in better shape. “We have seen guys come out on the backside better than the front by investing their insurance money wisely. New boats, new people create excitement and rates go up. They don’t come out ahead, but there is opportunity for improvement,” Tyler said. Rutherford concurs. “Build to newer and better. It’s an opportunity,” he said. Rebuilding is not, however, a panacea, and problems with claims appear after every storm. Marinas are often undervalued and not carrying enough insurance when they need to make a claim. This is especially true for electrical code upgrades. When docks are damaged, the electric on them is also damaged, but there is a high cost to replacing what was lost with what meets the latest code. Insurance companies and local brokers may be unaware of the required codes and aren’t assessing repair costs correctly, so when damage occurs the insurance policy isn’t providing enough money to cover the cost of repairs with electrical upgrades. Tyler commented that even in states that have not adopted the latest code, the contractors will likely refuse to put in anything old because the liability to them is too high. “Marinas find themselves with sticker shock when they see what electric will cost, and there isn’t anyone to pay for that,” Tyler said. Rutherford sees problems with upland flooding. “Flood is the worst part of building damage because unless there’s separate flood insurance, it’s not covered. The insurance industry separates out flood and leaves it to NFIP (National Flood Insurance Program). Marinas need to buy added flood coverage and many don’t,” Rutherford said. 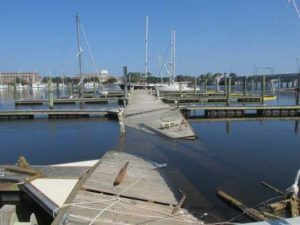 Flooding in New Bern twisted and destroyed marina docks. Tyler offer advice on means to best protect property. Both say hurricane plans are a necessity, and they need to be practiced and complete. 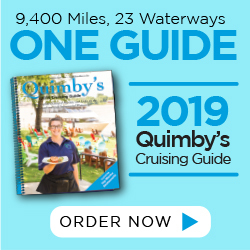 “I think because of different articles and awareness marinas do have written hurricane plans, but it’s likely not practiced and covering everything that needs to be covered,” Rutherford said. The plan should include complete marina records and documents stored offsite, including photos of every part of the facility, agreements in place with customers stating that the marina is permitted to strip and secure boats with no liability, and basic duty lists for all personnel. Tyler includes keeping up with maintenance as crucial means to limiting damage exposure. Loose boards, cracked trash cans, piles of trash can all become more hazardous when wind is blowing and waters are flooding. He said that in his experience marinas that are well maintained fare better than those that are not. Both encourage marinas to strip the boats to remove all windage and that contracts should be in place with boat owners to allow marinas to strip boats in the event of the storm. “Some of things I like to drive our customers toward for prep is to remove as many vessels as possible,” Rutherford said. He also recommends moving larger vessels from the outer perimeter. Higher wind profiles (of larger boats) can break free easier. Even moving larger boats to inner dock sections helps. Rutherford also recommends cross tying boats and docks because extra spring lines can make a difference. Some infrastructure may also help reduce damage. Rutherford noted that wave attenuators can greatly reduce storm damages, if the marina knows its fetch and surge potential. Pile height is also a major factor in storm protection, he said. “If any story needs to be told it is to design a facility to handle an abnormal surge height that you’d never imagine, 12 to 16 feet is possible. If piling are 8 to 10 feet above mean high it won’t work. Once they float off the top, your marina is literally up the creek,” Rutherford said. While preparation is crucial it is difficult to prepare for each potential storm scenario. “One thing I can stay for sure is that every storm is different. Every storm has its own set of challenges. We were watching Florence for a week and a half, and we were terrified at the suggestion it was going to be a Cat 4 or maybe 5. That would have been a disaster, but the collective claims managers’ prayers were listened to. It was a Cat 1 borderline 2, which made all the difference in the world,” Rutherford said. He continued that there was less boat damage than anticipated and less damage to facilities on the barrier islands, because the main source of damage from Florence was from winds and surge pushing water up places like the Pamlico Sound and New Bern River, where it had no place to go but over the banks and into neighborhoods and businesses. The surge and flooding caused damage to inland facilities while coastal ones fared well. With less wind, vessels saw less damage, but marinas and boatyard saw more. “On the beautiful sunny days following the storm, yards were watching their docks starting to come off piling because the flooding had reached them,” Rutherford said. Both men commented that the devastation from Hurricane Michael was like none they had ever seen with the only positive that it was very localized. But anything that was in the direct path was damaged or completely destroyed. 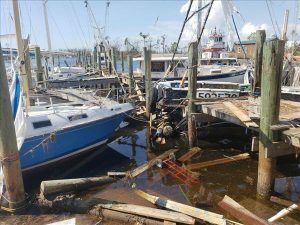 Websites of three marinas in the Panama City area held these messages: “The marina is closed for the foreseeable future due to Hurricane Michael,” said Panama City Marina in Panama City, Florida. “We are still in the process of building demolition and dock rebuilding,” said Treasure Island Marina in Panama City Beach, Florida. “Due to the unfortunate circumstances effecting the marina operations from the recent hurricane Michael on October 10, 2018 the Marina will be closed for a period of time allowing us to rebuild,” said Port St. Joe in Port St. Joe, Florida. Tyler emphasizes one of the most crucial areas of concern post-storm is electric. “Our typical spiel is telling the guys the most important thing is safety. Get out there and deal with any electrical first. Get it off and bring in an electrician to test things. By and large, the dock guys are very careful with electric, but the boat owners don’t understand that electricity is the danger,” Tyler said. He has seen boaters cut locks off the breaker box to get the power on. Even with exposed copper in the power lines, Tyler has seen boaters still trying to turn it on. It is the duty of the marina to mitigate any additional damage once the storm has passed, Tyler said. If items are tossed around the yard, deck boards are popping, shutters are hanging, the marina should do a little bit of work to strap things down, use spare boards to nail things together and do the best they can to keep things in tact before the real repair begins. He suggested that leaving damage alone often just makes it worse. Both insurance representatives recommend patience. “Realize it’s a long process and especially when you’re dealing with a hurricane. Everybody is busy, contractors are busy, it takes a long time to recover,” Tyler said.